East Rutherford, N.J., - Local Chevrolet dealers unwrapped 77 of their brand-new, red Malibu cars and packed them with toys to spread holiday cheer. Chevy dealers from New York, New Jersey and Connecticut helped out local families by donating nearly $20,000 worth of gifts during a one-of-a-kind toy caravan today. "Chevrolet and its dealers are celebrating the arrival of our all-new midsize car, the Malibu," said David Klemm, Chevrolet's Northeast executive sales manager. "This event gave dealers a chance to drive the new models -- and to fill the hearts of children in their communities. It's the best kind of celebration." The parade began in East Rutherford, N.J. Dealers drove to three local Toys"R"Us stores in search of perfect holiday gifts for needy children in the area. Each Chevy dealer donated $250, and New Jersey State Police cleared the way for their shopping. Once they arrived at the stores, the dealers loaded the toys into the trunks of the Malibus, then returned to East Rutherford, where U.S. Marines helped unload the toys into a semi-truck for distribution by local Toys for Tots, the U.S. Marine Corps Reserve charity program. Chevy also presented a $2,000 check to the New Jersey Chapter of the Survivors of the Triangle Charity and the NJ State Police. The Survivors of the Triangle is a national organization which provides resources and assistance to surviving families of law enforcement officers killed in the line of duty. 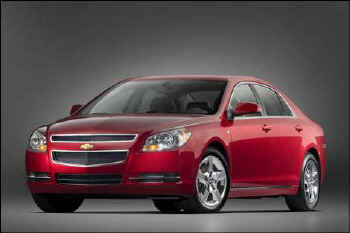 The vehicle that made this event possible was the all-new 2008 Chevrolet Malibu. "The Malibu delivers great performance, fuel economy and refinement, wrapped in a clean, tailored design," Chevy's Klemm said. The range includes a fuel-saving Malibu Hybrid model. For more information on the Malibu, visit www.chevy.com. Chevrolet is one of America's best-known and best-selling automotive brands. With the largest dealer network in the United States, Chevy is the leader in full-size trucks and the leader in sales of vehicles priced $35,000 and above. Chevrolet delivers more-than-expected value in every vehicle category, offering cars and trucks priced from $9,995 to $83,175. Chevy delivers expressive design, spirited performance and great value with standard features usually found only on more expensive vehicles.